Alex Butcher (a.k.a A L or Alexandra), authors fantasy fiction for adults. She kindly interviewed me this February, which is my official first interview! I am trying to corner AL Butcher for a counter-interview, to get her take on Beauty In Weird Fiction; she has an interesting milieu regarding Magic-Elf-Eroticism that would be great to learn more about. Actually, our stories will appear together this May in HEROIKA -- DRAGON EATERS (pre-order link). 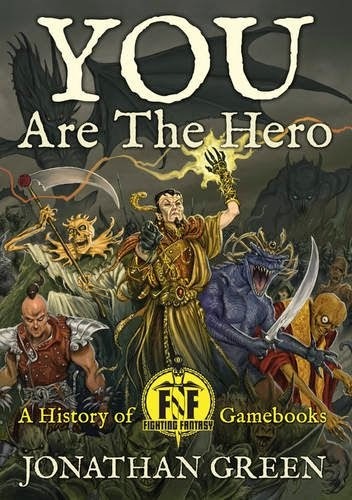 Check out this anthology of Heroes hunting their legendary foe across centuries! Seth (S.E.) Lindberg, Jack William Finley, Travis Ludvigson, Tom Barczak, Jp Wilder, Joe Bonadonna, Milton Davis, Alex Butcher, Will Hiles, M Harold Page, Walter Rhein, Cas Peace, Beth W. Patterson , Bruce Durham, Mark Finn. Heroes throughout history stalk their legendary foe: the Father of Alchemy entombs his own magic; dragons must not kill dragons; even a patron saint struggles when confronted by the mighty Wyght Worm; Hunting dragons, getting there is half the battle; mankind’s fate lies in a man, a child, and a dragon; holy warriors write their legend in the blood of dragons; the love of the innocent meets a dragon’s heart; one dragon hunter finds out the truth about feeding on dragon’s blood; one woman and two wolverines seek a dragon’s egg; cross the water and stop a new plague of dragons before it’s too late; bounty hunters pit their dirigible against a dragon and a flying castle; seven enemies unite to kill an ancient legend; In the bayou stews more than storm and alligators; remnants of the human race face their ultimate challenge in the bleak Arctic; when dinosaurs return, a squad of Rangers goes from dragon hunters to hunted. Many "Grimdark" fans seem young enough to miss some of this history. Thanks to Francesco La Manno for inviting me to discuss it. Wish I could read Italian to enjoy his other posts! BTW, the article is in English :). Mystery for the Horror Fan -- Cozy Gothic Noir Joe Bonadonna's Mad Shadows: The Weird Tales of Dorgo the Dowser is a great mashup of Horror/Fantasy/Film Noir. In Television terms, this would appeal to fans of the X-files, Supernatural, or Grim. Being a collection of tales, each serves as an episode. Expect: necromancy, mythogical creatures -- especially the hybrid horned creatures (satyrs, minotaur, etc. ), pitted against our protagonist who is motivated to set things right (and make enough money to eat…and perhaps a sustained glance at a beautiful woman). Gothic Noir: With the exception of one tale, Mad Shadows: The Weird Tales of Dorgo the Dowser proved to be more “Crime & Sorcery” than “Sword & Sorcery.” Dorgo is not an official constable or justice keeper, but he is hired layman with investigative skills and a magical dowsing rod which he uses on occasion -- much less than expected given his name “Dorgo the Dowser.” Bonadonna brands his Dorgo tales “Gothic Noir,” which is fitting. 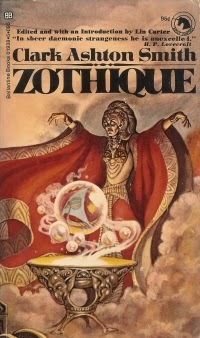 Despite the weirdness of Valdar city and the threatening necromancy that abounds, we know Dorgo will survive and resolve any case as surely as Fritz Leiber’s Fafhrd and the Gray Mouser did. Speaking of Leiber, Bonadonna call’s out Leiber as an influence; Bonadonna's style is unique but he delivers the same entertaining blend of weird adventure dosed with humor. Episodes: All are stand alone reads, except for the last one (“Blood on the Moon”) which leans toward being a sequel to the “Black Diamond.” Without spoiling, the first four are set in Valdar, and the final two explore some “old” territory…and we learn a bit about Dorgo’s past. 3-The Moonstones Of Sor Lunarum -- For T.C. Rypel fans, you’ll enjoy a call-out to his Gonji: Red Blade from the East. Orphan/Parent-Offspring Themes: The haunting dedication sets the stage for the themes of many of these stories: the dedication was extended to his parents and to “Mary Ellen Pettenon and the other 91 children and 3 nuns who became angles too soon in the Our Lady of Angels School Fire, December 1, 1958.” I learned on Facebook that Bonadonna is a long time Chicagoan, who was in the same school system and if his birthday was a few months different, he would have been in the building. In the book, we learn early on that Dorgo is an orphan, and many of the plots/character-motivations are based on family ties. Heroes throughout history stalk their legendary foe! 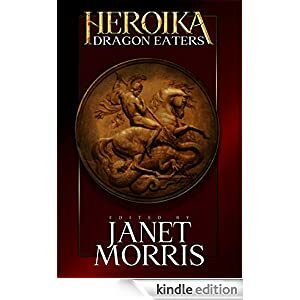 My short story Legacy of the Great Dragon appears in HEROIKA -- DRAGON EATERS along with sixteen more tales of dragon hunting/consumption, each with a varied milieu & style (from an awesome set of authors). Recipes will be shared online from many of the authors, so get your gear on, hunt some dragon, and prepare to make a wild stew! Or just pre-order the Kindle (Paperbacks to be available late May/early June). Highly recommended heroic fantasy coming your way from Perseid Press! Kindle pre-order's available now. About the editor: Best selling author Janet Morris began writing in 1976 and has since published more than 30 novels, many co-authored with her husband Chris Morris or others. She has contributed short fiction to the shared universe fantasy series Thieves World, in which she created the Sacred Band of Stepsons, a mythical unit of ancient fighters modeled on the Sacred Band of Thebes. She created, orchestrated, and edited the Bangsian fantasy series Heroes in Hell, writing stories for the series as well as co-writing the related novel, The Little Helliad, with Chris Morris. Story Summaries: Heroes throughout history stalk their legendary foe: the Father of Alchemy entombs his own magic; dragons must not kill dragons; even a patron saint struggles when confronted by the mighty Wyght Worm; Hunting dragons, getting there is half the battle; mankind’s fate lies in a man, a child, and a dragon; holy warriors write their legend in the blood of dragons; the love of the innocent meets a dragon’s heart; one dragon hunter finds out the truth about feeding on dragon’s blood; one woman and two wolverines seek a dragon’s egg; cross the water and stop a new plague of dragons before it’s too late; bounty hunters pit their dirigible against a dragon and a flying castle; seven enemies unite to kill an ancient legend; In the bayou stews more than storm and alligators; remnants of the human race face their ultimate challenge in the bleak Arctic; when dinosaurs return, a squad of Rangers goes from dragon hunters to hunted.